A month after a failed summit between Donald Trump and Kim Jong Un, things are getting even murkier with North Korea. 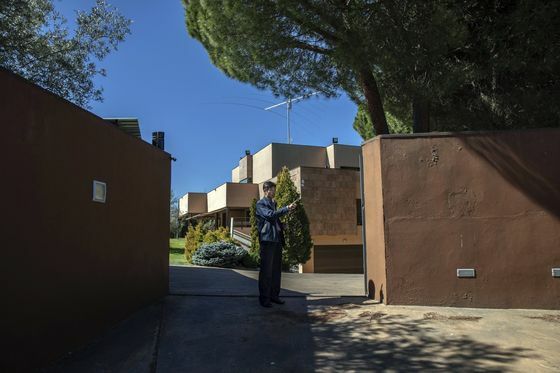 A shadowy group that wants to bring down the North Korean leader claimed responsibility today for a raid last month at the country’s embassy in Madrid. The group known as Free Joseon said it was trying to find evidence of illicit activity, while a court document indicates it made off with two computers and some thumb drives. In Washington, Bloomberg reporters shed light on a confusing tweet from the U.S. president last week saying he was withdrawing large-scale sanctions over North Korea’s nuclear program. People familiar with the matter said Trump tried to undo penalties on Chinese shippers that helped Kim evade penalties until White House aides persuaded him to back off. And in Seoul, South Korean President Moon Jae-in — who helped bring Trump and Kim together in the first place — is under pressure to get them talking again after their Vietnam summit collapsed. North Korea withdrew from a joint liaison office, only to return several days later. Taken together, the events show Trump, Kim and Moon are all searching for a way forward. But also that the risk for miscalculation remains high. Rocky road | The path to the White House for Democrats runs, in part, through Trump country. Yet few of the candidates running for the party’s nomination have demonstrated much ability to win on the president’s territory. Only three of the major Democratic contenders hail from states Trump won in 2016, and most of those who’ve run for statewide office haven’t had to — or been able to — triumph where the president was strong, a Bloomberg analysis shows. Mueller unveiled | Attorney General William Barr is planning to release his report on Robert Mueller’s probe into Trump in a matter of weeks, not months, Chris Strohm reports. House Democrats want Barr to submit the full report by April 2, although it’s all but certain he won’t meet that deadline. Click here for a list of significant inquiries related to Trump that have outlasted the special counsel’s investigation. Brazilian breakdown | Three months into President Jair Bolsonaro’s term, voters, investors and some supporters are starting to doubt if he can deliver on pledges to kick-start the economy and crack down on crime. The former army captain has plummeted in opinion polls and antagonized key allies, and his cabinet looks at times like it may collapse. Balkan ghosts | Two decades have passed since the war in Kosovo, but the country remains haunted by the thousands of victims mourned by still-grieving family members. Under pressure from the U.S. and the European Union, the leaders of Kosovo and Serbia are trying to reach a deal to mend relations and break a deadlock that has prevented them from integrating more closely with Europe. But as Andrea Dudik reports, that could lead to the redrawing of borders as the legacy of the conflict lingers. Rising star | Indonesia’s Sandiaga Uno has spent nearly $100 million of his private-equity fortune to defeat Joko Widodo in next month’s election, in what may be a down payment on his own presidential ambitions. Karlis Salna reports that Uno was a political unknown just a few years ago. Now the vice-presidential nominee is on a ticket with former general Prabowo Subianto, campaigning to win over voters disgruntled by economic disparity. With the U.K. Parliament holding votes today that could soften Britain’s divorce from the European Union — or even cancel it — there are signs that Prime Minister Theresa May’s Brexit deal may finally get support. But the price might be her job. Saudi rights activist Loujain Al Hathloul is scheduled to face a second trial session in Riyadh today with nine other women on charges of undermining security that include communicating with diplomats and journalists. Seven political parties opposed to Thailand’s ruling junta say they have the numbers to form a majority coalition, intensifying a tussle for power with a pro-military bloc and deepening uncertainty ahead of a vote for prime minister in late May to early June. And finally ... India is no stranger to powerful female politicians — former Prime Minister Indira Gandhi towered over the country’s politics for decades. But their success hasn't translated into a critical mass of women in parliament, Shruti Srivastava reports. 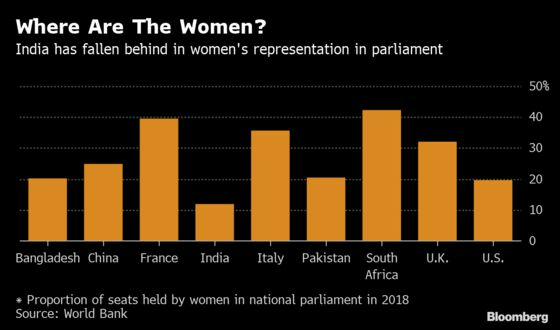 That could all change in next month’s election, with two regional parties introducing a quota system that’s likely to ease the way for reserving a third of seats in the 543-member lower house of parliament for women — a plan that’s been on hold for over two decades.